The perfect luxurious gift! 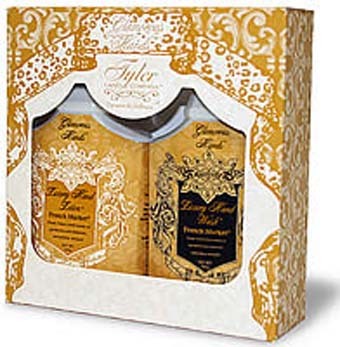 Includes an 8 oz Luxury Hand Lotion w/ pump, an 8 oz Luxury Hand Wash w/ pump and all packaged in a decorative baroque gift box. Diva is our #1 Tyler scent: A warm and complex fragrance overflowing with delicious fruits and rich florals. Rich aromatic chocolate and amber complete this luscious blend!